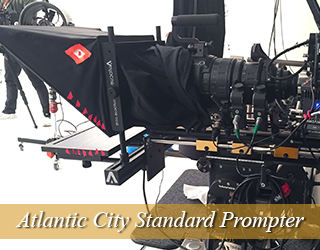 Our professional lineup of through-the-lens prompters include units manufactured by Autocue, Telescript or Prompter People. Our prompters can be set up on the tripod with the camera, or on a freestanding separate tripod in front of your camera. This unit enables talent to look directly at the camera while they read. The prompter takes about 20 minutes to set up. We recommend that you email or give the operator a flash drive with the script in Word format before the shoot. Please note that our operators have the capability to load and, if needed, make minor changes to the script on location. The delivery of the prompters within the city is free. There is a nominal charge of .56 cents per mile, plus any tolls outside the city. 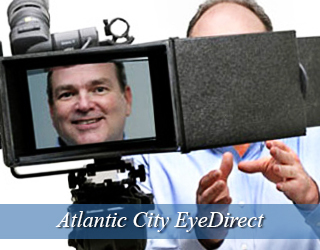 The EyeDirect Teleprompter is similar to the Mark III unit, it allows the director and talent to see each other. This makes it easier for the talent as well as the director because they are able to judge body language and speech. The EyeDirect costs less and is good for those on a tight budget. The unit weighs just 30 pounds and is a little bigger than an airline carry-on bag. The Presidential Teleprompter is a device often used for speeches given from behind a podium. This teleprompter is a two-way mirrored glass that the audience is able to see through but the speaker is able to see the reflected text clearly on the glass. We are called regularly to the United Nations and have worked with many politicians and celebrities such as Michelle Obama, Bill Clinton, and Beyonce. To go along with the teleprompter, we have highly experienced operators who are fully prepared for anything and know how to work under pressure of a live event. 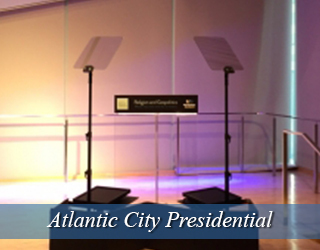 The Rise and Fall Robotic Presidential Teleprompter is another option for live events – and is best for events with multiple speakers. With the robotic prompter, the height of each panel can be adjusted remotely by the operator, allowing for a smooth transition between those speaking. The unit is available in New York but we can drive or ship the unit to you. 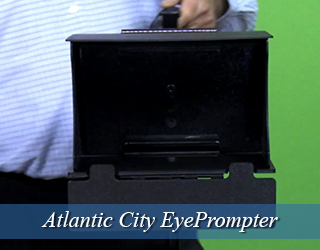 Our robotic prompter has been used in Boston, Philadelphia, Washington DC, Nantucket, Newark, Atlantic City, Hartford, Westchester and The Hamptons. 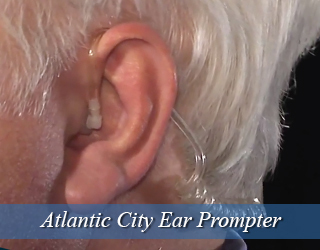 Presidential Prompter aka Speech Prompter Click Here “A List” Talent We Have Prompted For. Click Here. The Confidence Monitors are “flat screen” monitors that are located around the venue so that the talent is able to walk around free and is not limited to one spot on the stage. 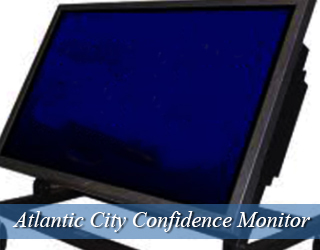 These monitors are able to pick up signals from any teleprompter. The amount of monitors placed around the room depends on the size of the room and how many the speaker feels comfortable with. 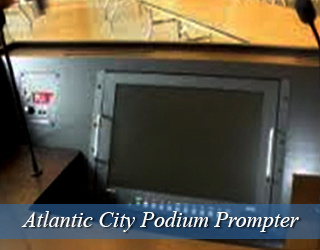 The Podium Prompter is known to be the most invisible due to its hidden screen and wires. The monitor is situated on the top of the podium and the speaker can look down at it as if they were reading from their notes. Founded in 1854 from consolidated sections of Egg Harbor Township and Galloway Township, Atlantic City has been an entertainment hub ever since. Originally developed as a resort town, the city has seen several iterations of its entertainment scene. From its prohibition-era speakeasies to its nightclubs in the 60s to its current east coast Las Vegas status, Atlantic City has always been an exciting place to be. 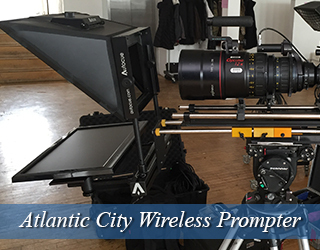 Its boardwalks and casinos make for a fun filming location, and New Jersey’s film tax exemption program sweeten the deal even further. Aneesa Cruz graduated from the London Academy of Music and Dramatic Art in 2009 and has appeared in a multitude of commercials and award winning short films. 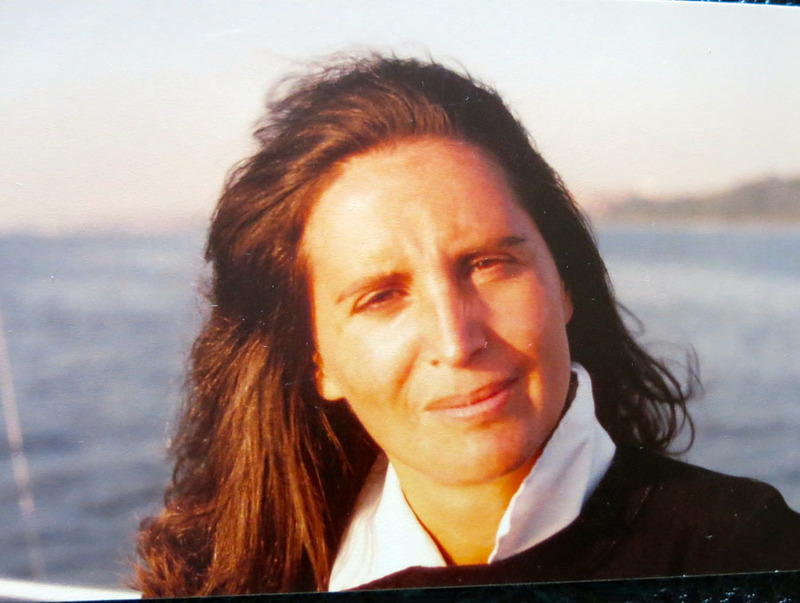 She began speech coaching in 2012. Since then, she has helped a variety of actors, performers and speakers improve their public speaking and teleprompter reading skills within the tristate area. Aneesa enjoys spending her free time baking with her two young children and reading. 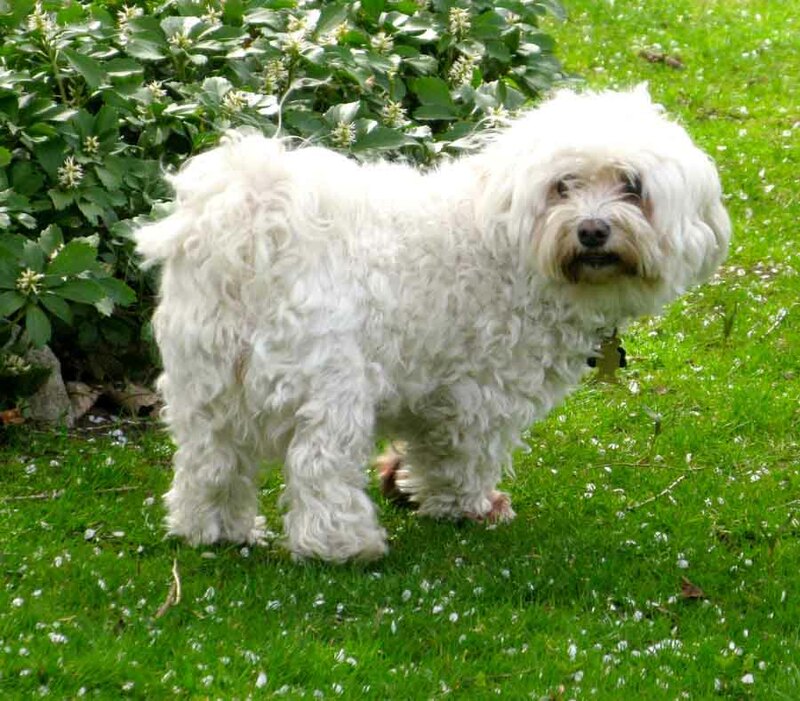 A recent addition to the household is Sophie, pictured below. The kids love to play with her. She makes us all smile! Jeff joined American Movie Company as a production assistant in 2010, while finishing off his final year at the School of Visual Arts. 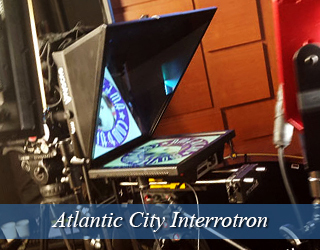 In 2012, Jeff became a full time teleprompter operator, servicing the tristate area. In 2015, the New Jersey native was then promoted to office manager of the New Jersey branch. He handles the schedules of all operators in the Jersey area, and oftentimes with the New York office to work on projects together. 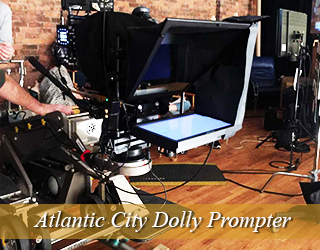 Jackie O’Neil has been a prompter operator for 3 years – and has worked with a long list of A-listers and politicians not only within the tristate area, but also across the country. She enjoys spending her free time doing yoga at the beach and watching Netflix specials while eating her favorite food, pizza. Jackie is also the proud owner of our New Jersey office mascot, Bilbo, who enjoys spending nights indoors on the couch and letting the office staff know when there’s a visitor at the door. 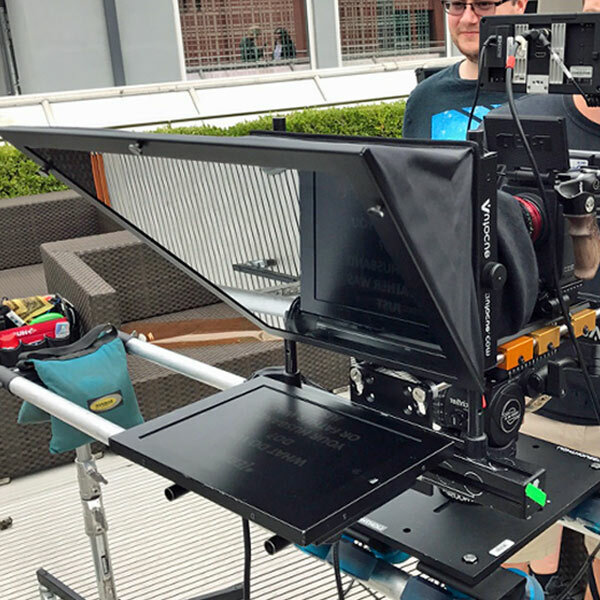 Recently our company did a huge shoot that used four teleprompter units in all – one a Presidential Teleprompter! You’ve seen those whenever you’re watching a politician speak to a large group of people. It looks like a rectangle piece of glass on top of a pole. There are two of those one on each side of the man or woman addressing the crowd and the way it works is great. The speaker reads the speech on those pieces of glass that is being scrolled by an operator out of sight. The audience doesn’t see any words – just that contraption. It takes skill to be a teleprompter operator, and patience too. I started out as a production assistant. I am now responsible for a host of different tasks and have to prioritize and think on my feet every moment. I love the responsibility and I dare say the creativity too. I first heard about this job from a friend who was working as a massage therapist at a super fancy hotel and spa in town. The film company was hired to shoot a promo. Every set is a small world. She got to talking to the woman operating the device known as a teleprompter and found out both their sons went to the same school! The world is so much smaller when people stop and actually engage with one another. When I’m not working I love to get together with friends and explore everything that this city has to offer. One of my favorite restaurants is Krung Thai. Not only is the food fantastic but the karaoke is a lot of fun and there is a spectacular dance floor. Luckily, I’m not a big gambler. I’m not sure how I would do living in an area where I was surrounded by constant flickering temptation. It would be like loving cupcakes and waking up to a world made of frosting. Very dangerous for someone like me. Last year, we filmed one of those cooking show “cook offs” for a charity event. I had never seen Top Chef so I had no idea what to expect from the participants or the crowd. Wow, was I taken aback. The audience was filled with a heat that rivaled the kitchen. It was exciting, hectic, creative and riveting as we all watched them work against the clock. The best part of that day was actually eating the scrumptious food when the shoot was over. I would never have guessed that brown sugar and meat balls made such an incredibly delicious combination. Yum!